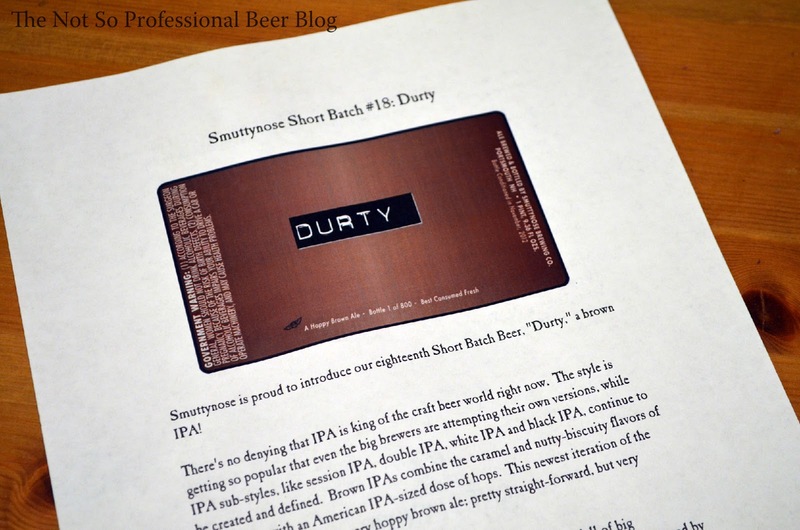 The Not So Professional Beer Blog: Review: Durty, Smuttynose Brewing Co. Description: "There's no denying that IPA is the king of the craft beer world right now. The style is getting so popular that even the big brewers are attempting their own versions, while IPA sub-styles, like session IPA, double IPA, white IPA and black IPA, continue to created and defined. Brown IPAs combine the caramel and nutty-biscuity flavors of a brown ale, with an American IPA-sized dose of hops. This newest iteration of the hop bomb is essentially a very hoppy brown ale; pretty straight-forward, but very delicious." — Smuttynose Brewing Co.
Random thoughts: In addition to its Big Beer Series, Smuttynose also features a Short Batch Series. These limited release, experimental beers are brewed in very limited volumes (20-30 barrels) and are available primarily on draft in the East Coast. Durty, the 18th edition, marks the first time a Short Batch brew is being released in 22 oz. bottle conditioned bombers. I was lucky enough to sample bottle 316 (out of 828). The tasting: Dark brown in color, with a frothy tan head that dissipatesvery slowly. When held up to the light, some dark orange hues are visible. Somesediment particles from the bottle conditioning float through the glass. Aroma is full of pine, roasted malt and grapefruit. Flavorstarts with a strong dose of piney hop bitterness. In the middle, flavors of coffee, caramel,and chocolate emerge. I even tasted notes of bourbon. Underneath it all is abready / biscuit-like malt backbone. Overall hop bitterness leans toward the highside, but it’s not overwhelming. Durty is medium bodied, moderately carbonated,and has a resinous mouth feel. It finishes with roasted malt, a touch ofalcohol, and lingering piney hop bitterness. Rating: 4 star. Really Good! I want this again! I believe Durty is the first Brown IPA I've tasted. I'm amazed by how each of the many sub-styles bring their own unique twist to IPA. 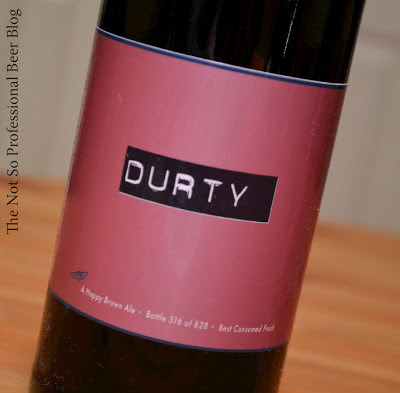 Although somewhat similar to a Black IPA / CDA, Durty had caramel flavors that I usually don't find in Black IPAs. This beer is in very short supply. So if you happen to stumble upon it, don't pass it up! Have you tasted Durty or any of Smuttynose's Short Batch Brews?